Wow, my friends are so right! Apparently I need to blog more often, as I always have a gazillion things saved up to talk about all at once, lol! I'm going to restrain myself and only share two of them this time... and hopefully post again in the next week (don't faint, please). I am thrilled and honored (and VERY LATE in saying so) to have two of my pieces published in Jill Wiseman's gorgeous book, Beautiful Beaded Ropes. Horn of Ammon and Colorplay V. II were lucky enough to be featured in Jill's gallery pages, and I am just so excited! If you haven't seen this book around yet, you should run to your nearest book shop and check it out instantly. Her projects are insanely beautiful, and she has made them in such a way that you can easily customize each piece to suit, making them either every-day wearable, or ramped up and super sparkly! 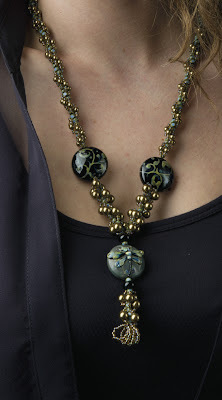 I have a favorite, of course... being the nut I am for right angle weave, I am in love with her Heirloom Necklace. It's fab-u-lous!!!! Here is a picture of it, in all its glory - isn't it wonderful?? My second favorite, which is actually tied for first with the Heirloom Necklace, is Falling For you... I have many, many lamp worked beads, and some of them must have this treatment! (I bet you have a few too!!) And this one is one of the ones that I feel you can customize the most, because you could have insane amounts of fringe (who, me?) with really elaborate focal beads or you could have it as she's made it with with smaller focals and reasonable fringe, elegant and ready to wear anywhere. I also have a new tutorial in my shop this week, Bollywood Bracelet, which I hope everyone likes. It includes instructions on making a matching pendant and earrings as well as the bracelet, and it would look fabulous as a choker style necklace, too - I am making one for a very special friend of mine, who helped to test the tutorial, and also helped me with ideas on the clasp for the bracelet. The second photo is of the choker in progress... This is the second new one, actually, as I never blogged about the release of my Juliet tutorial, which is also available in my shop. Would love to have the tutorial for it and the book looks great aswell, have only made 1 beaded rope as i only have 1 pattern for it so would love to find out what else is out there! Done! What a fabulous prize. :oD You know I have plenty of lampies that need homes and this book is already on my wish list along with your Bollywood Bracelet tutorial. Hi Nancy, I agree you should blog more often! Your topics and comments are so interesting and inspirational! I'm off to post a " like " on Jill's page. Thanks for the chance to win! What a great giveaway. I would love a chance to win. Nancy you are so generous. I would love to win the ropes book and give the tutorial to a friend as I already have it. This looks like a fab giveaway thank you Nancy and Jill. Pennies don't stretch to purchasing at the moment so it would be fab to win. Thank you Nancy!! This is a wonderful, as well as, generous giveaway. Your designs are the best!! 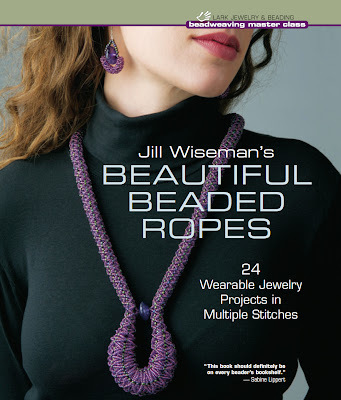 Some beautiful pieces in Jill's book, your tutorials are also exquisite as well. Will be going to Amazon next and liking, though I think I have done it recently! Oh well what's another vote of confidence! Nancy, I would love the win this book and love your new tutorial. Ok, this is just a fabulous win-win situation! Nancy, I'm totally overwhelmed at this giveaway! And crossing fingers and toes!! Very nice of you to do this! Live seeing your work and your posts on FB in the group bead stash! Thanks! Is it Xmas already ? Waouh this is a great giveaway, I'm in ! Wonderful giveaway! Strangely, I'm not wild about the necklace on the cover, but love every other piece I've seen from the book. I love your Bollywood bracelet. It's neat how you've shown two clasp variations. I don't think anything can be as drop-dead gorgeous as the original color scheme, but I'd be more likely to wear the second. I'm not entering this one (Hubster has ordered me one as a gift) but would just like to encourage the more frequent blogging as it is always a treat for me to drop by! Lovely Bollyvariations too! Thank you for the chance at winning this generous giveaway. I have been eyeing this book for a while now. Your Bollywood bracelet is gorgeous and the Juliet necklace Oh my I love it! I have gone by Amazon and liked the book. Oh and congratulations on your blog award that Jennifer gave to you, well deserved indeed. Woohoo! How fun! I love your Bollywood set and would love to make one. :) And the book is fab, too! Oh, count me in. I would love to win. Such a generous giveaway! As if winning the book isn't enough, there are your tutorials too?!?? Awesome! Hope I win! The colliers are gorgeous, the books is super, so I am coming!!! The pink clourway of your new Tutorial is my favorite! Stunning! I would love to win. Oh, that book looks wonderful! 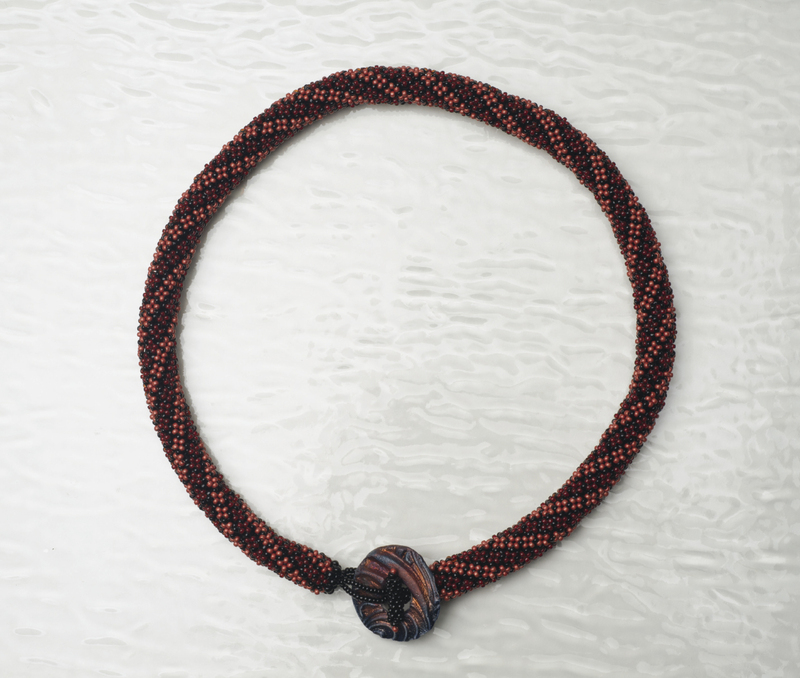 Beaded ropes sound like a perfect addition to bead embroidery pieces. And I'd love it if you blogged more often. Seriously! a wonderful book! would love to own it, it has all kinds of inspiration for using my collection of lamp work focals! I have been wanting this book ever since it came out! And the tutorials would be great as well. Thanks for the great giveaway! Wow Nancy :D....i would love this book! thank you for the wonderful chance :D! What an amazing giveaway. I love your Bollywood Bracelet. Dear Nancy, I have been out of the loop, not only not blogging, but not reading blogs as I usually do. I had seen your Bollywood bracelets on fB tho and LOVE them. How wonderful to have tutorials available! I will have to go and check out this rope book ASAP. Thank you for your informative and beautiful posts!